Minor, minor thing (only as a reminder, not worth any intervention until *something else* is needed). RMPREPUSB created USB stick (Removable) with "hidden" 0x21 partition, the 2nd partition (or 2nd partition entry) is not enumerated correctly (it remains 0), more loosely the "Number" in the view should really be "Slot Number" or "Entry Number"
Actually, this is a "normal" behavior : windows only "consider" the first primary partition on a removable disk. All other partitions are non existing (for windows) and therefore numbered with 0. As opposed to a fixed drive, where all partitions would be numbered. Are somehow confusing, the working of the former could be included (consolidated) in the latter, removing one menu item. Actually, "Convert RAW to VMDK/VHD" would need to be reworded : it does not really convert but actually creates a header. Disk conversion is mostly meant as converting files (vmdk, vhd, ewf, vdi, etc) to RAW. In your next update you may also update grub4dos 0.4.6a to a more recent version. Sure, and as said it is "minor", but if you go Advanced->MBR, the # is about "Partition entry" or "Partition slot", that is what I would find confusing if I didn't already know about the matter. Maybe - similarly to the PBR editor, you could have "valid" (as seen by windows) partitions with white background and "not valid" (as seen by windows) partitions background gray. , but IMHO the number should be referred to the "entry" or "slot". No, allow me to diasgree, the scope is always that of making things as simple and as less confusing as possible. A conversion means to "transform" something in something else. If you transform a whole disk RAW image into a "fixed" VHD by means of a header appending a footer you are converting. If you transform a "fixed" VHD into a RAW image by means of stripping a header footer you are converting. If you transform a whole disk RAW image into a "fixed" VMDK by means of a header (do you actually do that conversion? Or are you adding a VMDK descriptor file? Haven't tried. ) you are making a conversion, etc. In other words, I would find easier to have a choice "Image format conversion" where you can chose as source and destination suitable "couples" of formats, without the "special cases" for RAW to VHD and RAW to VMDK. It now contains a version.txt just like clonedisk.zip. Beware that the x64 version is always slightly behind (extra work is needed for the x64 version). it may help others : below the batch I use to generate version.txt. 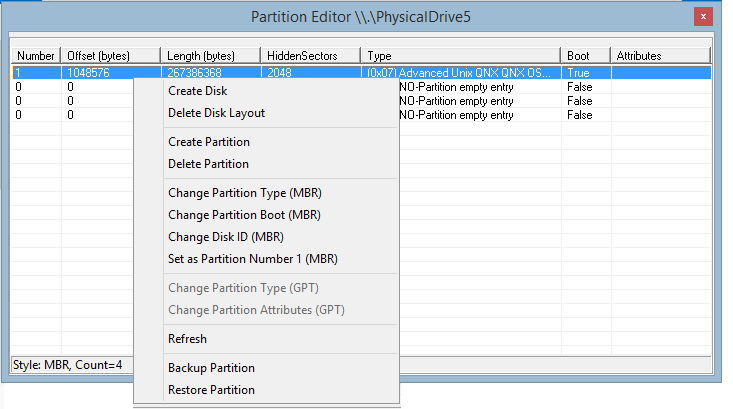 May be of interest for Wonko, latest version can backup/restore partitions directly from the MBR editor. 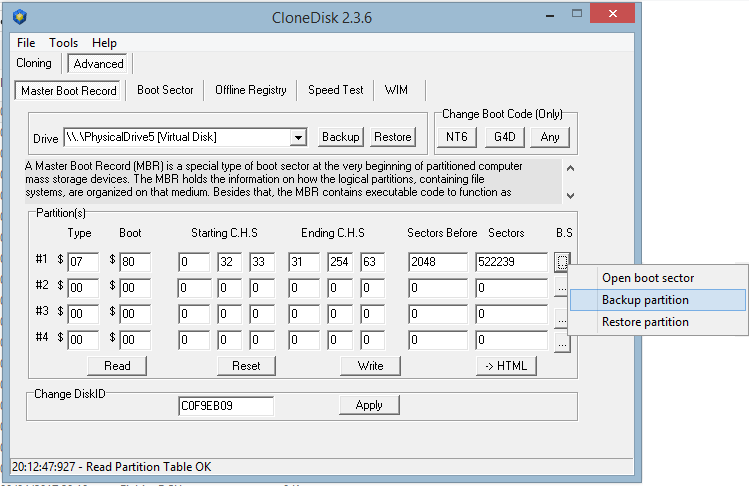 The MBR editor can also parse a disk image. One can also perform the same task in the partition editor. Main difference is that MBR editor parses the MBR when Partition editor uses windows API. this is taken care of in latest version. I'll give it a thought. For now, partition number comes from windows api/structure here. About the partition number as recovered by the api, it makes little sense to show the value 0 that it is returned ( as 0 ) , I mean. I do understand how the Api would return a 0, since the numbering is 1-based, maybe it would make more sense to "translate" the 0 to "N/A" or something like that. If I get this right, this would happen only on non-first partition entries on Removable media, which would raise an interesting (side) question. What happens on Windows 10 (latest-latest) that seemingly just changed the way Removable media is threated? Hello, Im trying to restore an image but no clue. I made an e01 image with encase 8, image from whole 500gb HD. Now I need to restore it to other 500GB HD. How can I do it? The software dont show me any HD when I click disk unit, only when I click disk part. The HD is new, its not formatted. How can I choose this new HD and restore the e01 image to it? Edited: It was giving error on x64 version, with 32 its working normally. Edited by rafael84, 11 May 2017 - 08:19 PM. Glad you found on a solution the solution. On x64, I believe you need to explicitly run as admin whereas on x32 CloneDisk will natively run as admin (provided you are an admin). X64 version has been updated to version 2.3.6. First post in this thread has been updated with a link (here) to the x64 version. Current version for X32 is 2.3.7 (work in progress). Did not read yet the ImDisk thread but clonedisk has been modded to take into account your report. There should no longer be a "# produced by CloneDisk". I seemed to remember I had told you, but today, while posting on the IMDISK thread I checked that my posts on forensicfocus were in September 2017, while last post here was June 2017, so I wan't sure it had been "fixed". Anyway all is well that ends well . you beat me to it again : i did search for it (as I too remembered that discussion) but could never find it ! First time I hear about this format. It is probably manageable thru the virtdisk.dll API's which I use already. Current VHD and VHDX are supported in CloneDisk . I have uploaded a new version that may supports VHDS extension when creating/opening a virtual disk file. I added that feature "blindly". Indeed, you need windows 2016 to use VHDSET (and I dont have a w2k16 available). On a system not supporting this new "provider", you should get an error like "provider not supported".